There are others, but the majority of tube testers are one of the following four types. Filament checkers are the earliest, appearing the 1920s. 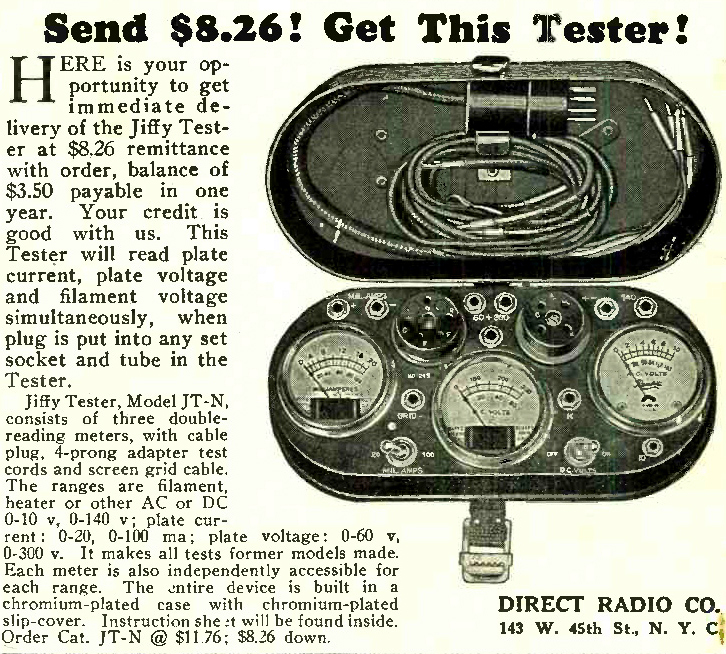 Early tube radios used the filament voltage to vary performance of both the audio and RF amplifiers. Broken filaments were a prime mode of failure in early tubes. Filament checkers quickly and easily identified bad tubes. Emission checkers appeared in the 1930s and ran through the 1960s. They are by far the most common. Basically they work like this: they power the heater at the necessary voltage, and put a known voltage between the cathode (whether it's the filament itself or a separate element) and the plate, and measure the current. Grids are shorted to the plate. Early emission machines measured current directly in milliamps, and the user would have to look up the acceptable value. A stronger current suggested a strong tube; a weak current suggets a weak tube. Later emission checkers went to what Hickok called an "english" scale: some version of "Good" and "Replace," where the needle pointed to the tube's strength. Stronger currents pushed the needle to the "Good" side, weaker currents left the needle on the "Replace" side. Machines with english scales have a compensation knob, and you look up the value in a booklet when setting up the machine to test a particular tube. The compensation allows the meter to be adjusted to handle both voltage amplifier tubes, which have small currents, and power tubes with stronger currents. Emission checkers judge a tube's performance entirely by emission; it is has been said that a good emission tester will find 80% of tube failures. Emission testers in particular vary in quality; the better ones may have a variable load to limit the current to a safe level for the tube being tested; many do not. Dynamic checkers add an AC signal to the grids and thus mimick an amplification test. They typically have the name "dynamic" in the name as a selling point. Alan Douglas believed that they were not necessarily any better at emission testing, but often offered more features, such as the ability to test for gas. Trans-Conductance (Gm) are true amplification testers, and generally considered a cut above emission testers. Gm testers put an AC signal on the biased control grid to measure amplification. The meter should be calibrated in micromhos or Siemens, or possibly mA/V. Between the end of the WWII and the early 60s, most Gm testers are Hickoks, as they had a patent on a circuit to make the test. Beginning the 1960s, after the patent ran out, more companies, like B&K, began selling Gm testers.